The Fujizukas are man-made mounds made in the image of Mt. Fuji. 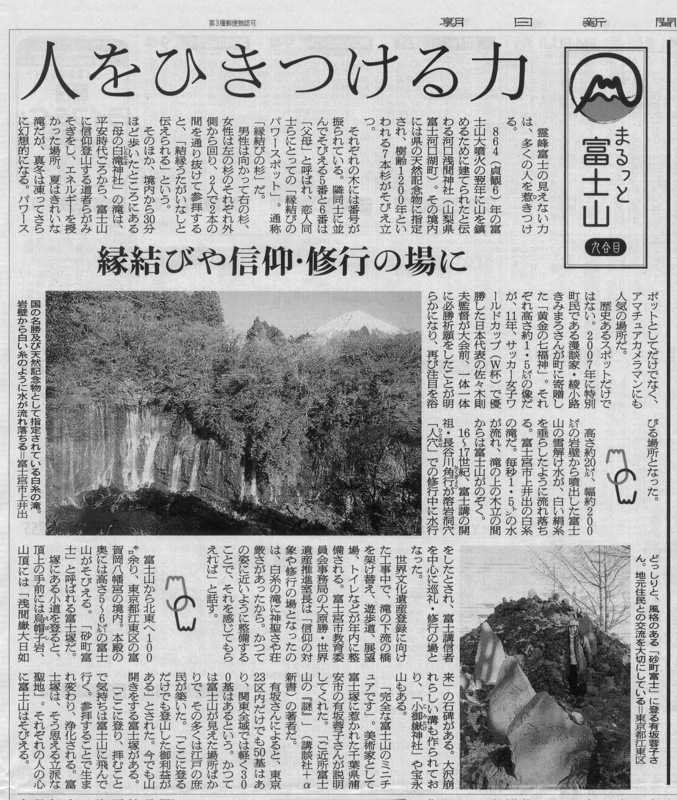 Methods are in sync with making a mountain, to alter and form an existing hill until it mimics the form of Mt.Fuji. Some are also made from volcanics of Mt.Fuji. Through this, followers of the Fuji regime implant their prayers. Many Fujizukas are constructed by members of the Fuji regime, spreading out from Kanto region as the center; furthermore, traces of Fujizukas also exist at the Hongū Sengen Taisha at the summit of Mt. Fuji. A three-dimensional depiction of the homage paid towards Mt.Fuji during the Edo period. In the frontal view, a female figure pays homage. At the time, it was prohibited for women to climb higher than the 2nd station of Mt. Fuji. WIth the volcanics of Mt. Mihara as a complement, tumbling clouds were painted blue and white, added with eboshi rock (a kind of black topper hat from the Heian period, eboshi rock refers to a lava rock similar in appearance), torii gate, as well as the accessory of womb-like foliage. Arisaka Yoko's most contented piece. “Volcandles” derived from the combination of the words Volcano and Candles. This new term seeks to remind people that Mt. Fuji is also a volcano, and that this fact in itself remits a sense of awe. By inserting an electric candle in the Fuji mound, it can even be seen in the darkest of places. The Mt. Fuji represented by the Fujizukas are emotionally entangled with Japanese people, and directly enthralled the Japanese artist Arisaka Yoko in creating the mobile Fuji mound, allowing the faith and dependence that Japanese people have in Mt. Fuji to be carried in their pockets, and providing more and convenient opportunities for worship. This kind of innovation intricately linked with her experiences in the United States, as foreign lands exaggerate distances and conjure immense feelings of nostalgia. After returning to Japan, she learned of Fujizuka which had reminiscent qualities of the abstracted torii she had created during her stay in the US. 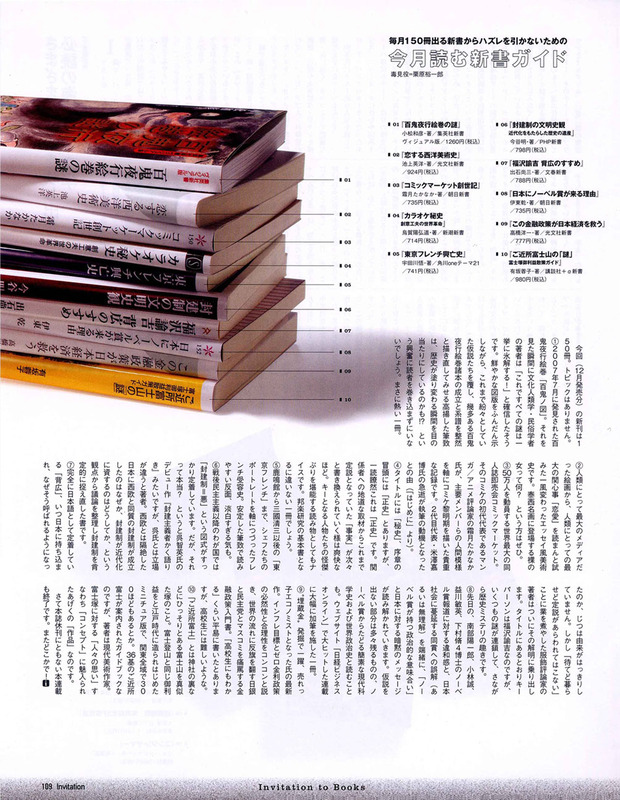 She became interested in the Fujizuka and started her pilgrimage, researching, understanding, and venturing on to the designing of the “Fujizuka,” subsequently created table-top Fujizuka pieces of work. 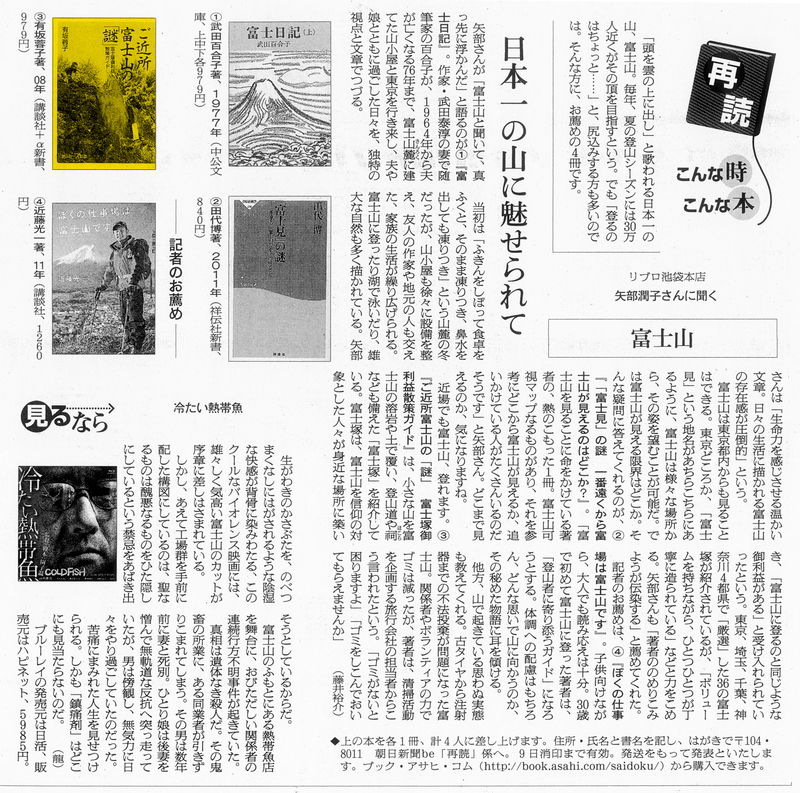 It is worth to mention that Arisaka discovered that mountain peaks in China also have similar meanings of nostalgia. In history, with the relationship between China and Ryukyu being intimate, and their geographical position being close, many people of Ryukyu are immigrated Chinese descendants, with a large population from the province of Fujian. 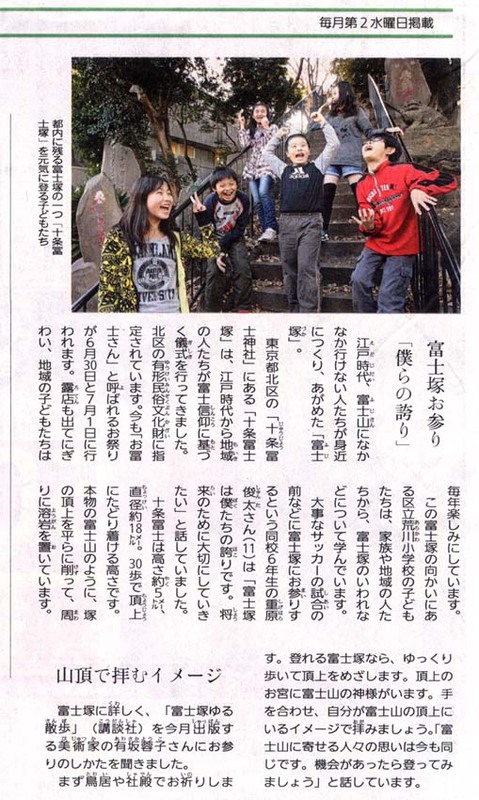 Meanwhile, Ryukyu immigrants in Fujian are also in the large. In 14th century AD, a group of special artisans from Fujian, referred to as the “Kume Sanjuroku-sei,” made a settlement in Naha where the village was, thereafter, named “Kumemura.” Nowadays, in Kumemura, there is a scenic Chinese garden, known as “Fukushūen.” In the garden, there is a man-made hill, modeled after Osan (Wu Shan) of Fukushū (Fu Zhou) province of China. It can be imagined that the creation of this “Small Osan (Wu Shan)” was for the easing of nostalgia of their homeland. The nature of such intent is the same as that of the Fujizukas. 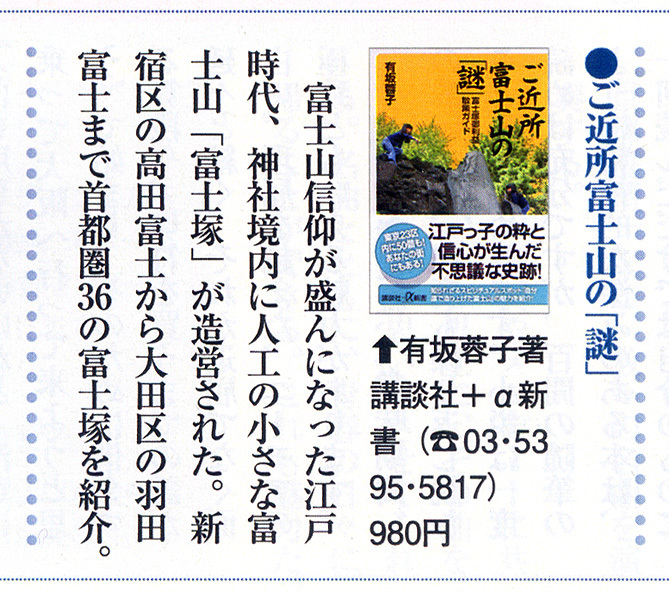 To Arisaka Yoko, both the pilgrimage and the making of the Fujizuka are ways of expressing her feelings within. 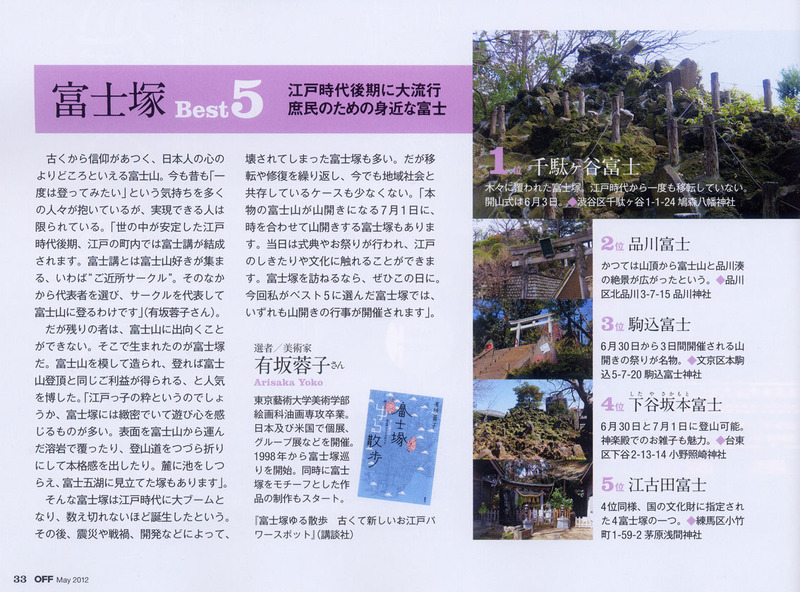 There will also be people who discover support and dependence in the Fujizukas which can be conveniently carried and seen, even in places far away from home and from Mt. Fuji. Artist, Fujizuka Artist, graduate of Faculty of Fine Arts, Tokyo University of the Arts, with major in Oil Painting. During her 12-year-long stay in the United States, she hosted many personal and group art exhibitions related to Japan. She has also attended music and dance festivals. 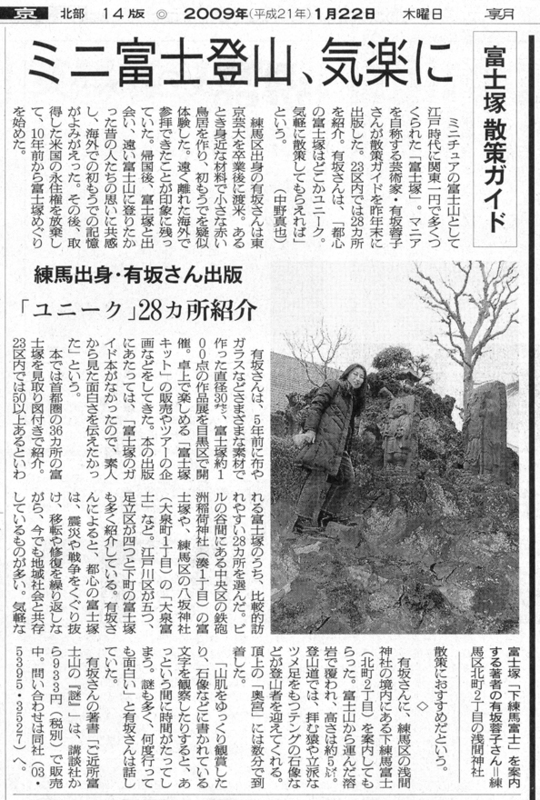 She started Fujizuka pilgrimages in 1998 while designing and creating miniatures of Mt.Fuji, and conducted investigations and researches through her own unique perspectives. 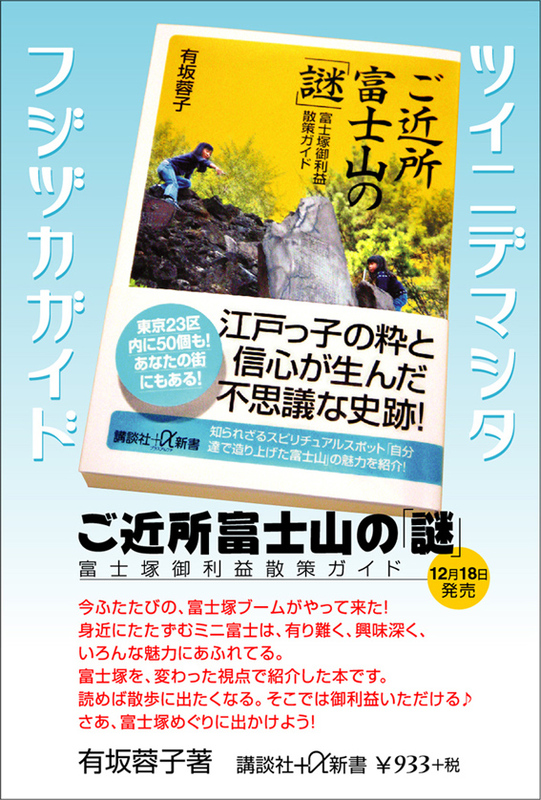 Authored 《”Mysteries” Surrounding Mt.Fuji》(ご近所富士山の謎) ,《Strolling Fujizuka》（富士塚ゆる散歩）, and etc. Zhi Ri : Your major was originally fine art and oil painting, but what inspired your interest in the Fujizukas? Arisaka Yoko (here on after as “Arisaka”) : Although my major was oil painting, after graduation, I have produced many sculptural works, joined theatre productions, and etc. I lived in the US for 12 years, during which my focus was mainly in the modern arts, and did not have works related to my own country. At a Japanese New Year’s party, someone said: “We are not in Japan, so it isn’t possible to practice “Hatsumode” (初詣).” Hatsumode is the New Year’s practice of paying homage to the shrines, commonly to pray for a pleasant year to come. At the spur of the moment, I cut chopsticks taken from Chinatown, assembled them into a torii-like structure, painted it a vermillion color, and toward it, everyone started to do their New Year’s prayers. At first it was just for fun, and everyone was happy. To those of us who could not return to our mother country, the simple torii that I made was a small shrine for them. It was then that I realized, even if the ceremony was completely made-belief, the feelings in our hearts converted it into a sacred place. I arranged the model of the torii and sake cups into a box and named it into a piece of work called “SAKE OFFERING KIT.” It allows the sacred ceremony to be completed at places where shrines do not exist or are not accessible. All it would take is to place the model of the torii at a desired place, pour Japanese sake in to the sake cups, and drink it. It was not until I returned to Japan that I found out about the many models of Mt. Fuji known as the Fujizukas. It is said that Fujizukas are made by people of the past, who claimed that the Fujizukas embodied the spirit of Mt.Fuji. 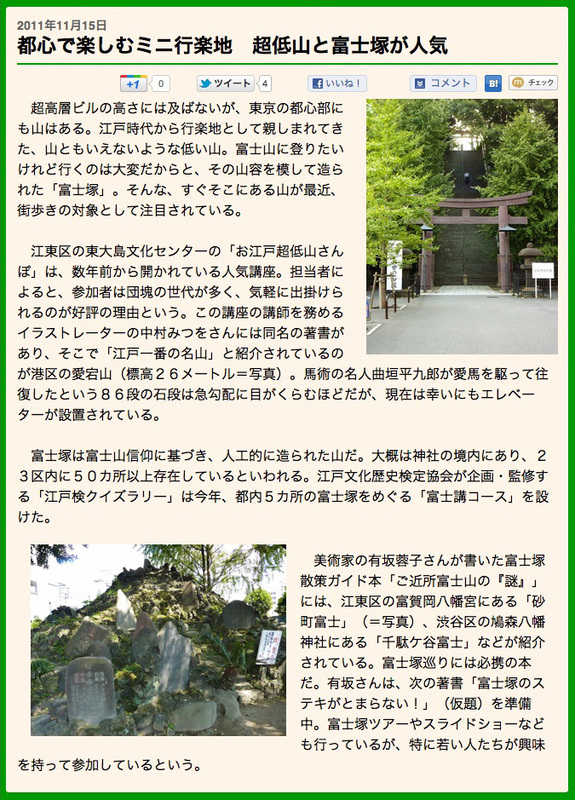 Since a long time ago, Japan has had a religion which said that spirits live in Mt. Fuji; that’s why everyone wants to climb Mt.Fuji at least once. However, not only was climbing Mt.Fuji expensive, along with physically challenging, especially for the elderly and children, women were also restricted from climbing for a long period of time. Then, the Fuji-kou was formed, who would draw ballots to choose a particular individual to climb Mt. Fuji, and the rest of the people would climb the Fujizukas. As the Fujizuka is made of volcanics from Mt. Fuji, it is believed that climbing the Fujizuka bestow the same benefits as climbing Mt. Fuji. 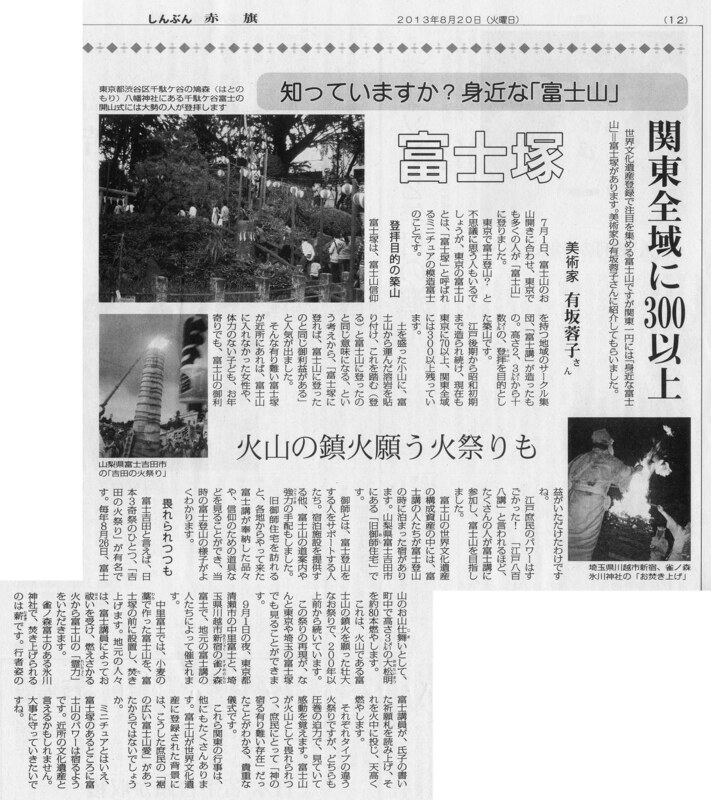 After I learned of the concept of Fujizuka, I found that it had the same feeling of earn as when I made the model of the torii. It is a place made by people’s nostalgic feelings and this, I think, is the commonality. This is where I found my interest in the Fujizuka. 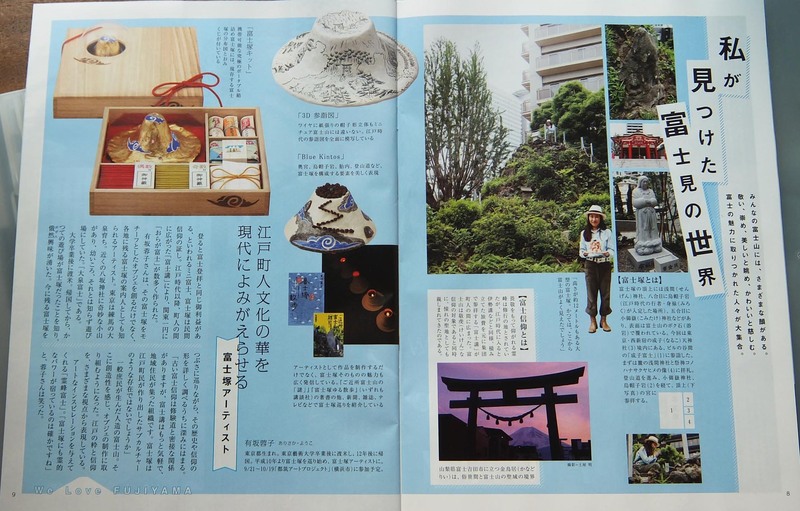 《Fujizuka KIT》 is an extension of the abstracted torii which she has created in the U.S. 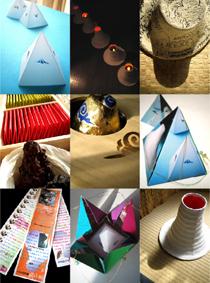 It is, similarly, a miniature of Mt.Fuji which can be placed on a desk. Aside from the gold leaf treatment of the main body, the kit also included fortune slips, a Fujizaka distribution map, and volcanic rock of Mt. Fuji, all placed together in a box. g. “Shitayasakamotofuji” of Taitou-ku, visitors on the public opening day of July 1st. Zhi Ri: In the process of your pilgrimage, what had the most impression on you? Is there anything interesting you would like to share with us? Arisaka: The very first Fujizuka appeared in 1779. By 1935, there were already many Fujizukas that existed. Now, there are over 300 Fujizuka across Japan, 60 of which are in Tokyo. Furthermore, since the ancient days, members of the Fuji-kou all ventured on pilgrimages. Although it can be considered worship simply by coming to a Fujizuka, since Mt.Fuji’s Mountain Day (July 1st), the Fujizuka have had the same ceremony in which many people carry out the “7 Fuji Pilgrimage,” which over time, became habit and tradition. 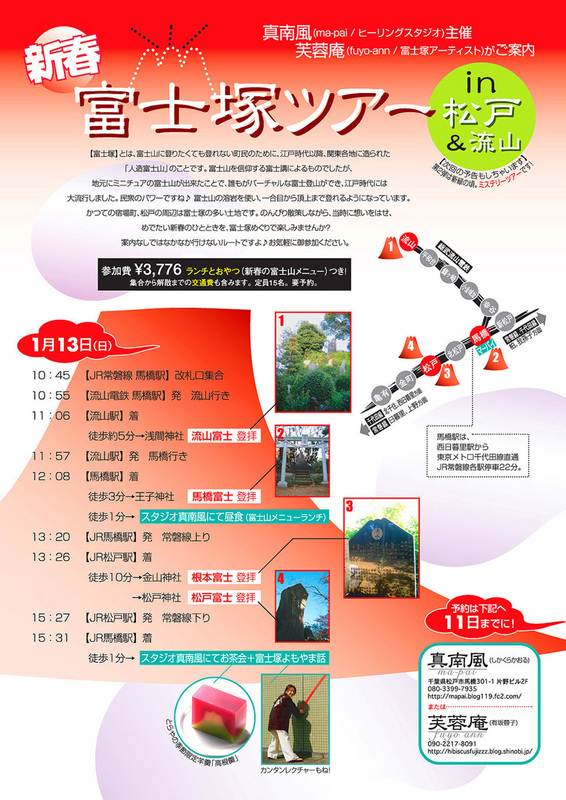 Some more aged Fujizuka only allow climbing on July 1; therefore, the “7 Fuji Pilgrimage” is actually quite a special event. Speaking of the Fujizuka which had the most impact on me, it must be the Shitayasakamotofuji in Tokyo, Taitō-ku. Shitaya-Sakamoto Fuji is considered a Cultural World Heritage Site, and in order to preserve it, it is not open to public and is only open for worship and climbing on June 30 and July 1. The most interesting aspect of the Fujizuka is the concept that it is intimately related to Mt.Fuji. 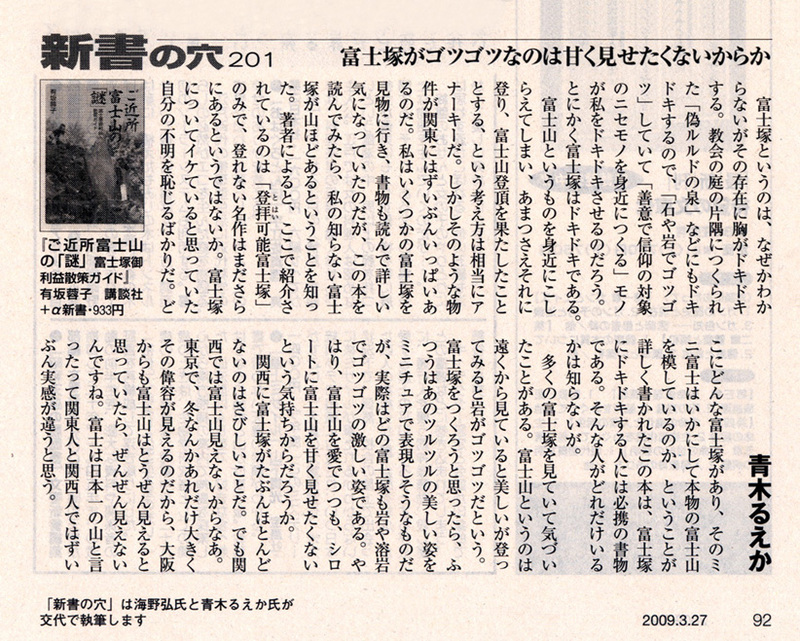 And that is due to this: that the Fujizukas are considered sacred as well. People worship the Fujizuka with the respect they have toward Mt.Fuji, wishing to be blessed by the spirits of Mt.Fuji. 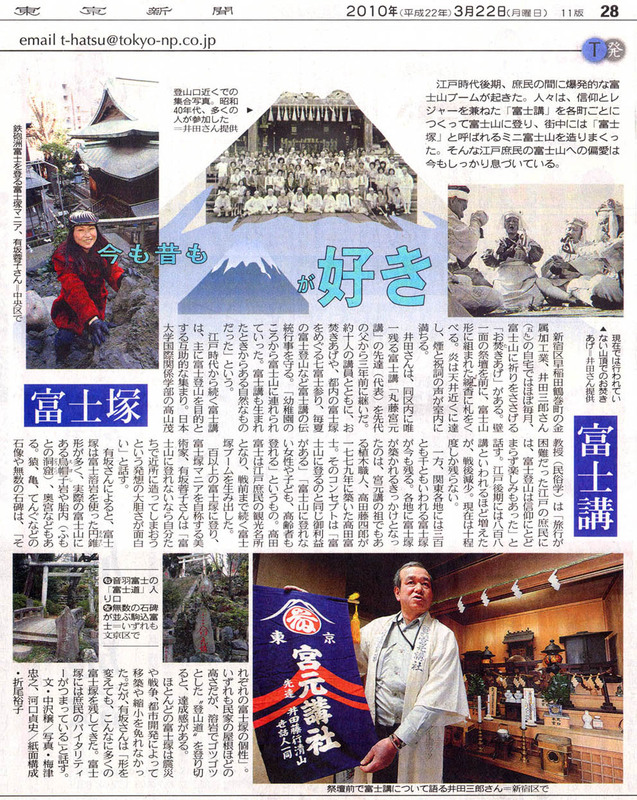 In other words, Fujizukas are like messengers which deliver prayers to Mt.Fuji. 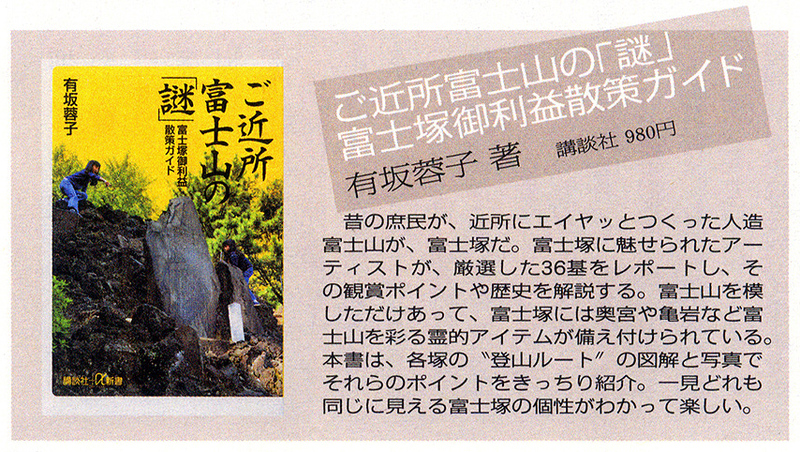 Zhi Ri: Fujizukas were built for worshipping Mt.Fuji in the days when it was difficult to climb. So to say, that in the convenience of modern day, is there still meaning in the existence of the Fujizukas? In other words, is there another symbolic meaning? Arisaka: Although transportation is convenient now, and climbing Mt. Fuji has become relatively easy, I still feel that the way people traditionally viewed Mt. Fuji should be understood. There are two parts to the religion of Mt. Fuji: the figurative “beauty” and the “fearfulness” of its volcanic being. From afar Mt. Fuji is beautiful, but the actual climbing of it is quite dangerous, so it’s safe to say that this climb is a sort of ascetic discipline(Fujizenjou). In reality, throughout a long period of history, the climbing of Mt. Fuji has been ascetic training(Fujizenjou). People of the past see the summit of Mt. Fuji as the world after death; hence, the act of climbing took on a special significance, (to complete the climb) is likened to the cleansing of rebirth. This is where another of Mt. Fuji’s meaning lies. Now, the relatively tranquil way of climbing is very popular, but climbing is nevertheless a very stern event. I think when people climb now, they should also possess the same mindset as people of the past, feeling the blessing that is of returning safely from Mt.Fuji and having a thankfulness for life. In comparison, not only do the Fujizukas possess the purity of “faithfulness,” they also possess the “playfulness” of being miniature. 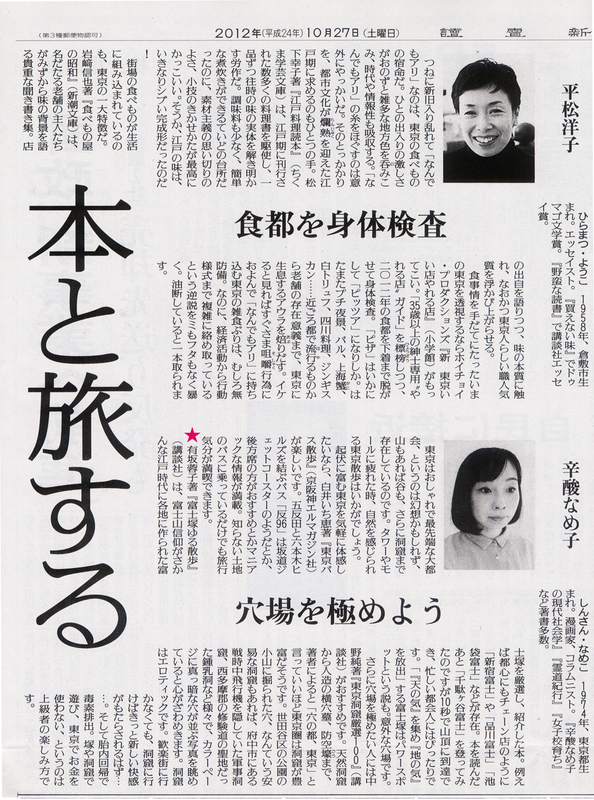 Zhi Ri: What kind of idea did you wish to express in your creation of the Fujizuka works? Is it the narrative of gentleness or the faithful belief? 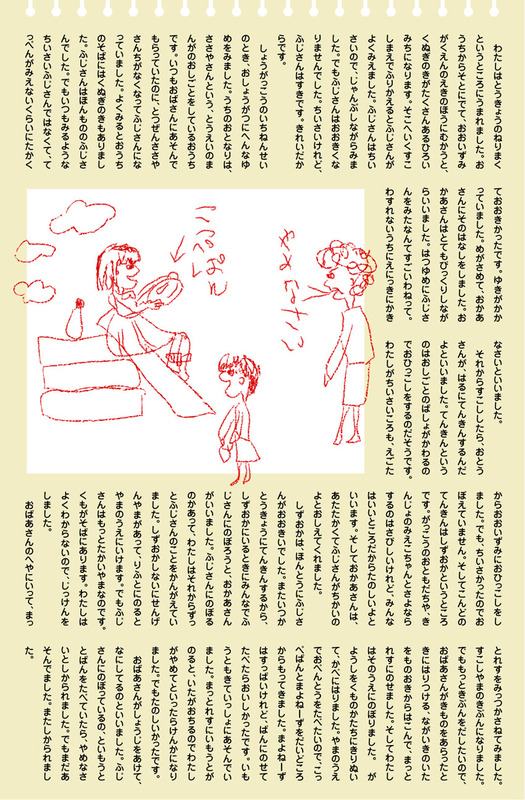 In the future, what kind of plans do you have for the Fujizukas? Arisaka: Even if I do not participate in Fuji-kou events, Mt.Fuji faith is nonetheless inherent in the hearts of Japanese people, similar to the ancient beliefs of animism. “Mt. Fuji is so beautiful that it must be inhabited by god and we should pay respects to it.” I believe that these thoughts triggered people’s beliefs toward the Fuji religion. It is also this pure and basic mindset that allowed people to take the step toward blessedness. 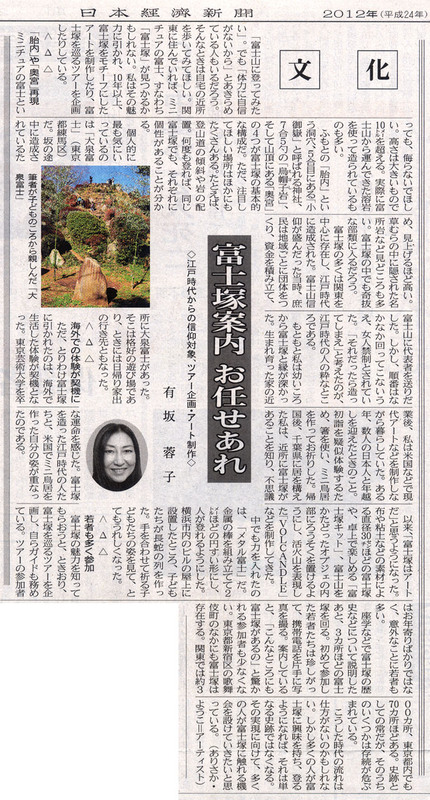 I want to understand why people of the past treasure Mt.Fuji, as well as to introduce art-related trivia with regards to the Fujizuka, and setting the “Fearfulness of Mother Nature” and “People’s Creative Powers” as a theme, create many more styles of works of Fujizuka. Of course, thankfulness is certainly not forgotten in the process of the making. 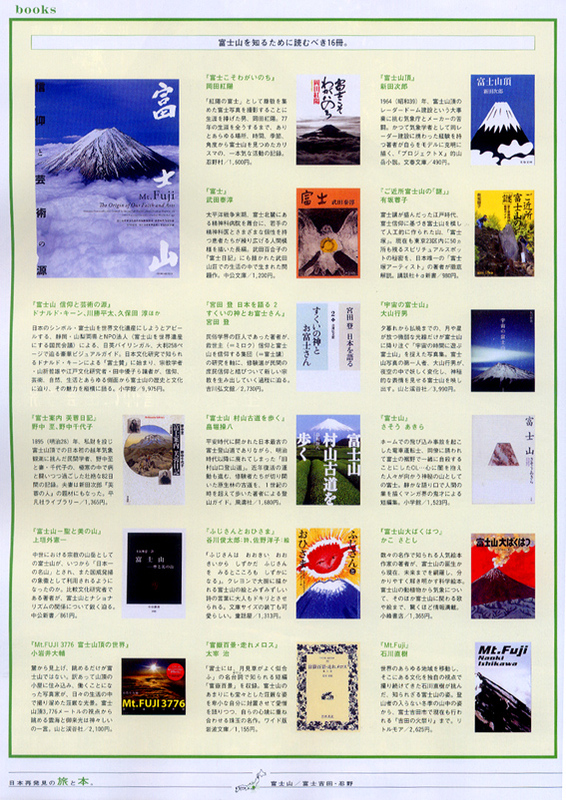 h. Fujizuka, is the “messenger” through which people can convey their prayers and wishes to Mt.Fuji. Like how each head shrine distribute its branch shrines across the lands, the god and spirit of its worship remain the same. 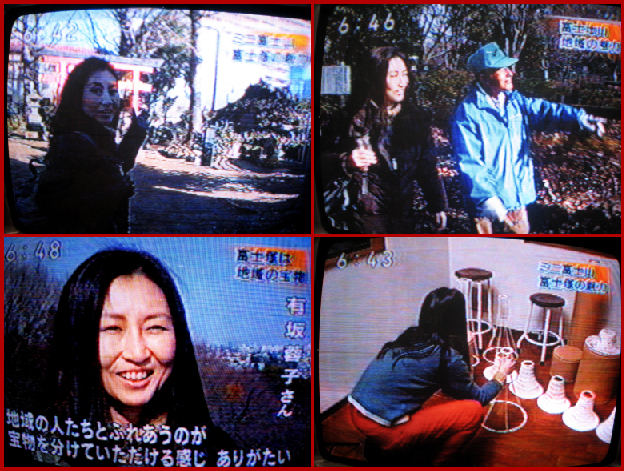 Facing the Fujizuka, people use the same method of paying respect as towards Mt.Fuji, along with the same sincerity. 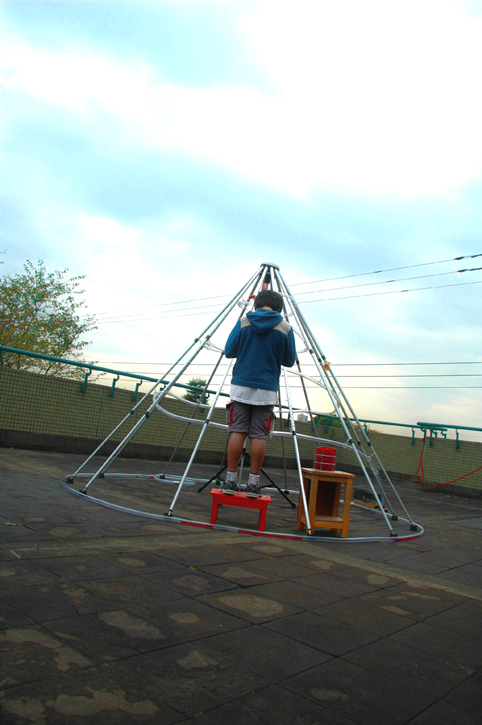 《Metallic Fuji》 is assembled from many metallic rods, and it can be compacted for portability and reassembled. This piece comes with a footstool; standing upon it means the “Climbing of Fuji”, and represents a relationship with Mt.Fuji. Upon making a wish, one should put the red glass bead into the spiraling tube. Since the glass bead would roll downward inside the spiral tube, the “descent” of Mt.Fuji is symbolized. At the end, the glass bead which safely reaches the ground becomes the “Gift of Mt.Fuji” and is given to the participant. This is a complete set of ceremonial worship, including imaginary worship with a tinge of play.